When Katherine wrote an ode to her trusty Le Creuset pot, it got me thinking about some of my beloved kitchen items that I’ve had for ages. I’ve written about some of my favorite tools before (see related stories below), but more in context of their low-tech prowess and flexibility rather than their endurance. 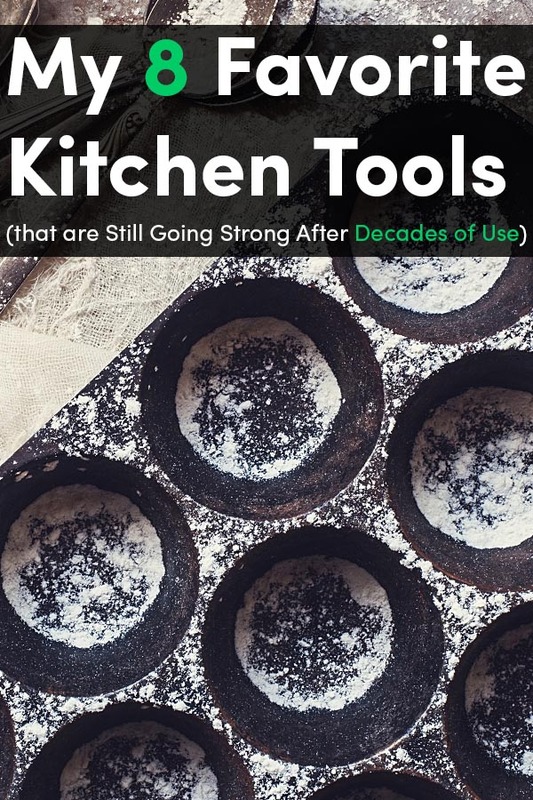 But in this day and age, when things are often made so shoddily, it seems prudent to give a shout-out to the old workhorses in my kitchen, the items that were built to work beautifully and live a long life. These are some of my favorites that came to mind. Our hand-me-down copper pans, shown above, are so dreamy that they make me coo like a freak whenever we cook with them. They had been in my partner’s family for decades before they came our way; and said family member is a chef, so they have seen a lot of use. Yes, copper pans take a little more care than some other pans, but there is nothing like cooking with them. Magic happens, for sure; food does not stick, the conductivity makes them heat up super quickly, and food browns beautifully but is hard to burn. 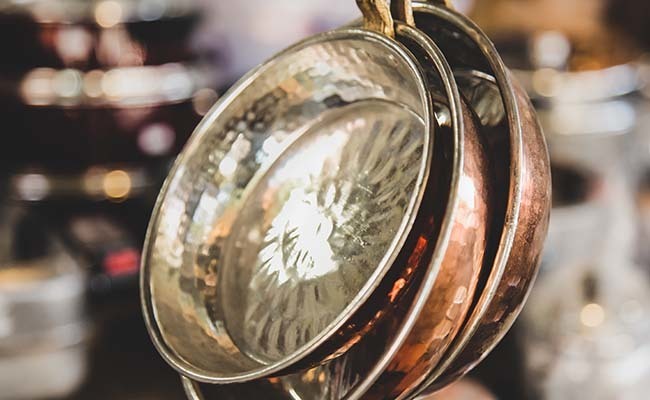 We had a few of them re-tinned, but many modern copper pans come with a stainless steel lining that is a bit less fussy. Either way, I am pretty sure these will last forever. Katherine waxed poetically about her Le Creuset pot, and with good reason – they are like comfort items for grown-ups. Aside from my Dutch oven, I came across an old and stained (but beautiful and green!) Le Creuset au gratin pan at a sidewalk sale and scooped it up for $5. I bake everything in it! From casseroles to roasted vegetables to baked pastas to, yes, even gratins. I love it not only for the way it cooks food, but it’s also nice on the table and precludes my need for a serving dish. A thrift shop find from decades ago, this mid-century beauty just keeps grinding and grinding and grinding. And it provides a great array of ground pepper, from fine to course. When I see those pre-loaded disposable salt and pepper grinders in the store, I am always shocked – why would someone buy a new plastic pepper mill every time they buy pepper? Yes, it’s a little beat up, but it’s a beautiful patina that shows its sweet heart underneath. I wouldn’t judge someone for judging someone for buying designer dinner plates because it does seem frivolous. But I got my (intentionally mix-matched) set of Calvin Klein dinner plates 20 years ago and they’ve been absolute superheroes. I have never tired of their clean design – a collaboration between Klein and the postmodern tableware company Swid Powell – which means I have never ever considered replacing them. But even better than their timeless appeal, is this: In 20 years, in a busy household that has seen babies turn into teens and a parade of rambunctious pets, only two of the 30 pieces have broken. We have used them every single day, we have dropped them, we have stacked them and dish-washed them and otherwise mishandled them, and yet they persist! The other day I accidentally whacked one on my stone countertop; the thwack was resounding, and not even a chip. My grandma gave me her muffin tins when she was downsizing, and while she is sadly gone now, her bakeware lives on. Every time I bring them out, I think of her with the fondest of memories. I mean, yes, they look old … but they should! I hope I can give these tins to my grandkids someday. Oh my trusty old friend, the ceramic ginger grater. I bought this slip of nubby porcelain in Chinatown for $3 when I first outfitted my kitchen, and I use it almost everyday. It is the easiest way, in my experience, to prepare fresh ginger – just rub the root on the grater’s teeth and a juicy pulp is achieved; I don’t even peel the root. I also use it frequently for fresh nutmeg, as you can see above, which is basically like catnip for me. I love that it’s ceramic but has never broken … and I especially love that I don’t risk grating part of my finger off, like I always fear with a microplane. While the copper cookware is slightly more delicate, my 30-year-old All-Clad pots have been thoroughly abused by me, and they still look practically brand new – well, more so after a hard cleaning, but still. Yes, there are cheaper pots and pans out there – but I am pretty sure these ones will never need to be replaced, and I adore cooking with them. I will probably be giving them to my grandkids along with my grandma’s muffin tins! And copper pots, and pastry scraper, and ginger grater, and … you get the picture. Long live the long-lived kitchen tools!